You know that Christmas song, Little Drummer Boy? I always thought that was a terrible song. Repetitive, dull, sort of corny. So imagine my surprise when, after my kids were born, I found myself getting this big lump in my throat every time it came on the radio. The photo up there is the centerpiece of our kitchen. It’s a dragon. Finn made it. The three eggs remind me of Game of Thrones. Finn had talked about this dragon for some time – he was excited to bring it home. 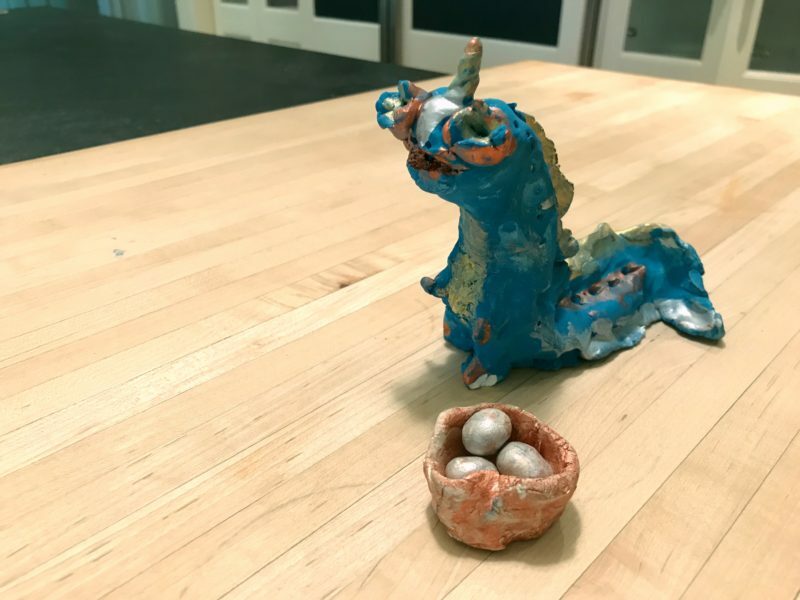 The truth is I’m not sure what I would think if I went over to somebody’s house and found that little clay dragon in the center of their kitchen island. I mean, I know what I would say. I would say this: Oh, that’s cool! What a great job your son did! That’s sweet that you keep it there! But I would actually be thinking this: That’s not exactly an attractive thing to have on your kitchen island and also I need somewhere to put the spinach dip so can I move that dragon or are you going to freak out on me? Children’s artwork is one of those things that parents love and everyone else is fairly unmoved by. Before I became a parent, when I would visit somebody’s house and find their fridge pasted with so much artwork that it looked like a localized paper tornado, I would always think to myself how much better and cleaner the kitchen would look if they would just put those papers in some kind of box. Maybe in the attic or whatever. That wasn’t me being cold-hearted. It was just not understanding why people junked up their kitchen like that. Then my own kids starting bringing stuff home. And I was utterly unable to throw it away. I was mesmerized by it, as if every day they had brought me a new painting they’d stolen from the Louvre, rolled up and stuffed in their backpack next to the apple they didn’t eat. My kids bring home crates of artwork, lugging it like a postman delivering the mail at an army base. And I sift through it, not wanting to miss a single jot or stroke. It begs the question: Why do I love this pink owl? Why do I love any of it? It’s easy to say “because my kids made it” but that doesn’t actually answer the question, because my kids make blanket forts all the time and it drives me bonkers because guess who’s folding up those blankets? It ain’t the dog. I love their art because nothing captures innocence quite like a child’s art. And please, please believe me that I don’t mean that sentence in the corny, rainbow-barf way it sounds. What I mean is this: We learn from a pretty young age to not put ourselves out there. Why do we sing in the shower? Because nobody’s around. How much creative stuff have you ever seen out of your friends? Who has shown you their writing or their drawing or sang something for you? For me, the answer is pretty close to zero. Of course it is! Nobody wants to lay themselves bare like that. It’s potentially mortifying. But kids haven’t figured that out yet. Our kids draw or sculpt or paint something and they can’t wait to show us. They can’t wait to gift it to us because they know we will appreciate it. We hang it up and we make it the centerpiece. That is what a parent is – when we are doing it right, at least: We are a perfect audience for the creation, because we adore the creator. This time of life, childhood, is that glorious moment that stretches out, the moment where our kids haven’t yet been told that they aren’t as good as everyone else because they are being held up to a standard that the world has created. But I will tell you in all honesty (and I think parents will back me up) that the sound of my daughter singing in her bedroom brings me exponentially more joy than any music I could listen to on the radio. I just stand quietly outside her door at night and listen, knowing it won’t always be like that. That’s what innocence sounds like. A girl singing and knowing that she is so loved by her dad that her singing is a gift, not something to be judged or evaluated or rated or made fun of or praised for its quality. I love Finn’s art because I love Finn. I love Lucy’s singing because I love her. All of that brings me back to the Little Drummer Boy. That boy in the song had nothing to give the new king. Nothing. 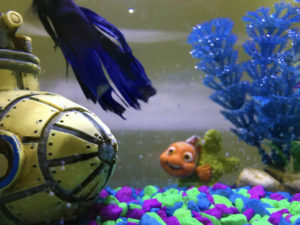 So he played his drum for him. Not because he was the greatest drummer in the land, but because he was a child and he trusted that he might be loved, even by a king. That king was – if you believe this – the son of God. If you believe in this, then you believe that the boy was a child of that king. And if you are a parent, you can imagine the joy that that flooded the king when the boy began to play his drum for him, like a dad listening to his child sing in her bedroom. The Top Five Art Projects I Did as a Kid. You remember those giant pages from kindergarten that were barely recycled and still had wood pulp chips in them where the top half was for drawing and there were three super wide lines at the bottom so you couldn’t possibly write outside the lines? I still have my first one. The drawing was me with a red ball and it said I had a red ball and that I liked playing with it. The truth was that I didn’t have a red ball. And I swear that to this day I still feel guilty about writing that. Let me tell you what kids aren’t making any more: Ash trays. Raise your hand if you’re from the generation that was still making ash trays for your parents out of clay, whether or not your parents smoked. I feel like my generation single-handedly forced my parents generation to keep smoking, because we kept bringing home ash trays and asking why our parents weren’t using them. 4. Me, Myself and I. My first grade teacher let us write a book and have it bound and everything. I called mine “Me, Myself and I” which I thought was awfully clever. It wasn’t long but it had drawings and information about me, like my name is Conor and I have these siblings and these pet parakeets and I like to play kickball. Which is really how I should be introducing myself as an adult. 5. Jupiter, King of the Gods. When I came home that day after singing that song in front of my sixth grade social studies class, I sang it for my parents. They clapped. And I was not embarrassed. I used to play around with the idea that there is no talking in Heaven, only singing. I don’t mean that we will only be worshiping 24/7 (by the way, will we still be able to say “24/7 “ in Heaven or would the angels look at us perplexed?). I mean that the language of Heaven is song. The idea stems from the thought that song transmits ideas and emotions at the same time. And in Heaven our minds and our hearts will always be in harmony with each other; at least, I imagine they will be. The other reason I thought this is because children sing, instinctively, often long before they speak. And, for me, that was great evidence that that was how God intended for us to communicate. I haven’t thought about that in a while. Lucy singing brought it back. I love that. I’m also totally fascinated by the fact that singing is the single easiest way to remember things. I can name all the auxiliary verbs because I learned to sing them to the tune of Yankee Doodle Dandy. So maybe it’s a way to preserve memories for eternity, which would be pretty cool, amiright or amiright? Loved the blog! So authentically you. Now I am sorry that I returned so much of that art to you when I moved. When my patients can no longer remember even their loved ones, they always remember The Lord’s Prayer and can sing You Are My Sunshine … great combination, don’t you think. I loved seeing that old art! What a gift to get when you’re 43! I’ve got to save as much as I can for Finn and Lucy. 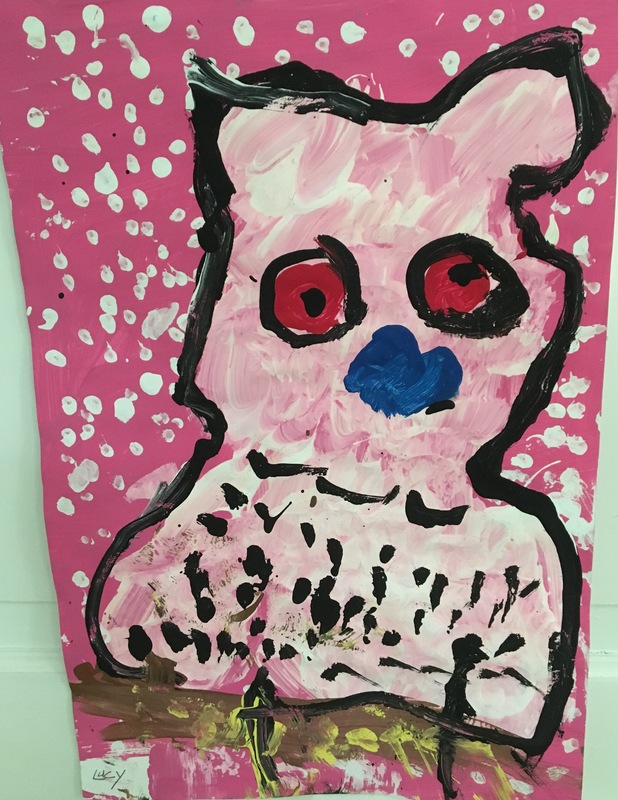 She’s going to mount that pink owl in a frame, mark my words. You are right. An eternity of memories and information will require a great mnemonic device. I can just imagine thousands of us floating around Heavan humming Yankee Doodle Dandy (or Row Row Row Your Boat or Twinkle Twinkle Little Star) so we don’t forget the directions to Alpha Centauri. And somehow in Heaven that won’t be annoying at all, right? First, the little drummer boy drew me to this blog post. I was not a fan of this song as a child… I heard it 1 too many times. Now every year I love it, and must play it first because it reminds me of June when I was a kid. Yes June. My brother was obsessed with this song. So he would request my mom sing it to him very often, so he could fall asleep. June is my brothers birthday and he almost shares it with my grandma so we usually have a joint birthday party for them. The year is 1995, I’m 5, my cousins are 6 and 4, and my brother is turning 3. We are all sharing a small room for a sleep over at my grandparents for the big birthday party. Pat (my brother) pipes up “Mom can you sing little drummer boy! ?” We were sung to sleep by my lovely mother who just figured if it makes the birthday boy happy, we sing it any day of the year . Re the kids art: Whenever I return home to my parents place, my childhood home, I am always fascinated by the art they’ve kept of mine and my brothers. My mom’s sewing room is like a mini gallery of the different stages of my drawing progression. First there was the “potato people”, which is just as it sounds round spud like shaped people with sticks for arms, bug eyes, and straw like hair in various colours. I would then label these large, obtuse people “Mom” “dad” “me” “Patrick”. My poor parents probably thought I needed glasses, as we were all slim people but in my art we were the potato family. These pictures crack me up. I got slightly better, by 15 I drew a really nice picture of a callalily that one made it to frame and still sits on my moms bedside. Anyways, my point is bless parents for encouraging us and supporting us, blindly… and in my case singing little drummer boy throughout all the seasons and we’ll into my adulthood keeping a very scattered gallery walk of my childhood art in the house. Kelsey, I love that! I feel like everyone should have a Little Drummer Boy story! And love the thought of your mom having the art through the ages and seeing how you got better and better – we are SO going to do that! When it comes to kids artwork, we are hoarders. Or were, until recently. We decided to photograph every piece of artwork and put it in a book for the kids (us) to keep. It eliminated three very large boxes from our storage area. We did frame a few for good measure. Right. Digitizing. That’s the answer. We do it with everything else! We’ll keep a few original masterpieces but otherwise…. I actually got a little lump in my throat.thinking of the cute things Finn and Lucy have done: the art work and the singing:). I know, right? They are super sweet! At the old cabin up north where I singly raised my sons, I had the “mom wall” in my bedroom. It’s hard to hang pictures on logs but in my room it was tongue in groove and perfect for the gallery. I remember adding to it, by hanging each and every meaningful piece that my sons had fully explained to me. I celebrated the magic of their minds and how they expressed it. We’ve moved several times and now I live alone. But in the old trunk at the end of my bed are all of those pieces of art carefully stacked in the top tray. About this time a year I pulled them out and look through them. With the circumstances of their childhood, not having a father present, they actually grew up with the magic of the woods and an understanding that the world is big and problems are small in the space of that. We camped, fished, traveled and discovered everything from fossils to tropical fish in the sea. They learned to think outside of the existing stressors, process their thoughts and to dream. It’s evident in their stories and art. If I could go back in time at any point and relive it, it would be from the moment I became a mother on, because it is the most gratifying and wonderful part of the life that I have lived. Moments that I cherish the most were celebrations where the only gift I received would be a song that they made up and played on their guitars, homemade cards, And a breakfast tray filled with soggy French toast and over cooked eggs on my birthday. I love every one of those memories. Thanks for this story. It made me open the old trunk and look through the art. Parenthood is a gift. It is a gift! I think made all the more special and sacred by how hard it can be. It makes those moments where they are gifting you with something feel so special because it is like watching your kids grow up in real time. Their job isn’t to love us but they do and there are few things sweeter than watching them show us that love!